Laotian Americans are Americans who were originally from Laos, a person of Laotian descent residing in America. Laotian Americans are included in the larger category of Asian Americans. The major immigrant generation were generally refugees who escaped Laos during the warfare and disruption of the 1970s, and entered refugee camps in Thailand across the Mekong River. They emigrated to the United States during the late 1970s and throughout the 1980s. Although many Hmong people and Iu Mien are from Laos, they have a distinct culture, language and ethnicity, and identify as different ethnic groups. They generally identify as Hmong Americans and Iu Mien American, rather than Lao Americans. The "national origin" category of Laotian American, which is different from ethnic groups, includes all ethnic groups who lived within the borders of Laos, such as the Hmong, ethnic Chinese, ethnic Vietnamese, and ethnic French or other Europeans. Laotian immigration to the United States started shortly after the Vietnam War. Refugees began arriving in the U.S. after a Communist government came to power in Laos in 1975 and by 1980, the Laotian population of the U.S. reached 47,683, according to census estimates. These numbers increased dramatically during the 1980s, so that the census estimated that there were 147,375 people by 1990. The group continued to grow, somewhat more slowly, to 167,792 by 2000. By 2008 the population nearly reached 240,532. Included are the Hmong, a mountainous tribe from that country with their own ethnic designation: Hmong Americans. The states with the largest Laotian American populations (includes colonies of the Florida (4,896, 0.05%), and Oregon (4,692, 0.1%). There are about over 200,000 ethnic Lao in America. Approximately 8,000 - 11,000 Americans are of mixed Lao and other descent. Ethnic Lao people may identify as both Lao American and Laotian American (see also Hmong American). The majority were estimated to live in the West (95,574), followed by the South (44,471), Midwest (37,820), and Northeast (15,382). Cities or regions with significant Laotian-American populations include the Seattle metropolitan area (enumerating 12,190; 0.4% of its population); San Francisco Bay Area (11,545; 0.2%); Dallas–Fort Worth metropolitan area (10,500; 0.2%); Sacramento metropolitan area (9,814; 0.4%); Minneapolis – Saint Paul area (8,676; 0.3%); San Diego metropolitan area (8,079; 0.3%); Fresno metropolitan area (7,967; 0.9%); Greater Los Angeles Area (7,120; 0.04%); Nashville metropolitan area (6,210; 0.4%); Portland metropolitan area (5,806; 0.3%); Chicago metropolitan area (4,762; 0.05%); San Joaquin County, California (4,266; 0.6%); Providence, Rhode Island (3,456; 0.2%); Des Moines, Iowa (2,270), Anchorage metropolitan area (1,997; 0.5%), Fort Smith, Arkansas (1,730). Smaller Laotian communities can be found in other cities and metropolitan areas across the United States. In the Houston, Texas. In Southwestern and Midwestern United States, there are Laotian communities in Denver, Colorado; Storm Lake, Iowa (400; 4%), and Wichita, Kansas (1,594; 0.4%). The Oaklawn-Sunview community near Wichita is 11.5% Laotian American. In the Chicago area, there are sizable Laotian communities in the suburban cities of Aurora, Elgin, Joliet, and Rockford. In the San Francisco Bay Area, the Laotian population is concentrated in the cities of Oakland, Richmond, and Santa Rosa. Elsewhere in Northern California, there are Laotian communities in Chico, Eureka, Redding. In central and southern California, there are communities in Fresno, Banning and Merced in the Inland Empire region, and in Tulare County, California, especially in the city of Porterville. In the 1980s after the communist takeover of Laos, over 10,000 Laotians settled in central California. Many of the Laotians settled in central California to work in the farmland there. Laotian-American populations have constructed numerous Buddhist temples, called Vat or Wat. Usually attendees adapt a house for religious worship. Over time, the congregation donates money to customize and add onto the facility, as well as to add fine artwork and craftsmanship, resulting in a Laotian Buddhist temple that has some traditional features. Examples include Wat Lao Buddhavong located outside Washington, D.C.; Wat Lao Buddharam of San Diego, California; Wat Lao of S. Farmington, Minnesota; Wat Lao Buddhamamakaram of Columbus, Ohio; Wat Lao Mixayaram and Wat Lao Dhammacetiyaram of Seattle, Washington, Wat Lao Buddha Ariyamett Aram Temple Morris, Connecticut. ; and the Wat Lao Mixayaram in Lowell, Massachusetts. With the growth of Laotian communities in more diverse areas, they have moved to and constructed temples in rural areas, such as Lane Xang Village, located between Lafayette and New Iberia in Louisiana. The first national Laotian-American publication, Lao Roots Magazine, was published in 2007. The English-language magazine is geared toward the younger generation of the Laotian-American community. Published in San Diego by a small volunteer staff, the magazine has reached widespread national circulation within the Laotian-American community. 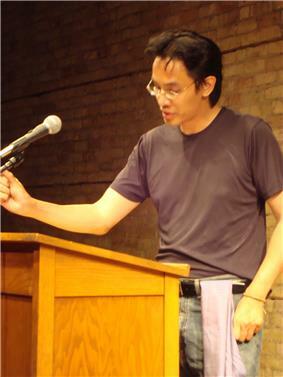 After the publication ceased, former staff member and Yale University graduate Siamphone Louankang created the popular online magazine LaoAmericans.com which continues to share stories by and about Americans of Laotian descent. The documentary film The Betrayal (Nerakhoon) was directed by Ellen Kuras and Thavisouk Phrasavath. It portrayed the epic of a family forced to emigrate from Laos after the chaos of the secret air war waged by the U.S. during the Vietnam War. Kuras has spent the last 23 years chronicling the family's extraordinary journey in this deeply personal, poetic, and emotional film. The film won a Spectrum Award for the Full Frame Documentary Film Festival; it is nominated for an Oscar for best documentary. The subjects of Lancer & Eranetik, two brothers from San Diego, California who share the same passion for breakdancing, was featured on America's Got Talent (season 6) with a dance team called The Body Poets and are now current performers in the Jabbawockeez - "MÜS.I.C" Show in Las Vegas, Nevada. They are also part of a breakdance crew called "The Calamities", which they created in 2002.